Shift Cycle Wear continues to look for opportunities to help those in need. Since 2010, Shift Cycle Wear together with our sister company Bend It Cycling raised thousands for great organizations like The Human Rights Campaign, Mercy Corps, Rock The Vote, Bike 4 Breast Cancer, Ride For The Children, Utah AIDS Foundation, Southern Tier AIDS Program, Meals on Wheels, and many others. 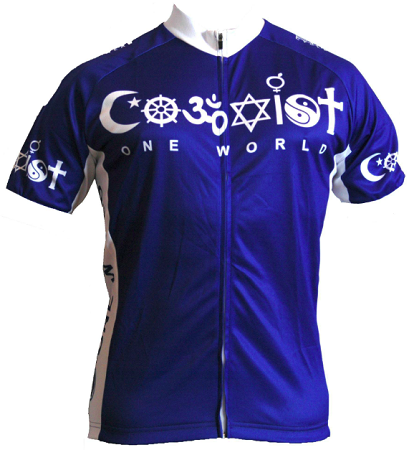 This new Coexist jersey marks the start of yet another initiative to help our brothers and sisters around the globe. The mission of our "Acts Of Compassion Know No Boundaries" campaign is to encourage people to cross all boundaries to help those desperately in need of food, water, shelter and healing all over the world. The goal of this campaign is to create even more partnerships with committed non-profit organizations and charities that we believe epitomize a focused, unwavering call to action to help those in need. Order your Coexist Jersey today and help us make an even bigger impact around the globe in 2012!